Centurion Country Club first opened its doors and fairways to the public in 1997. This centrally located 160 hectare Estate and Country Club captures the natural beauty of its neighbouring quaint village, Irene, and offers hospitality and old fashioned values on a brand new course. A golf driving range, four-hole mashie course, two tennis courts, and squash courts complete the picture at this superb sports club. Golf carts and caddies are available. The course is closed on Monday mornings and visitors may only book for weekend golf after 14h00 on Friday. A superb restaurant, seating 120 guests, Main Bar, private function room and terrace caters for all occasions. State of the art conference facilities allow for team building and communication in a private tranquil environment. 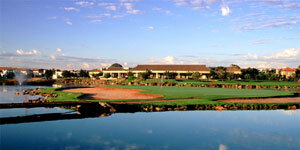 Centurion Country Club has become an ideal venue for golf days of all sizes. Our superior levels of service and our well manicured course are ideal for your next corporate outing. Please take the time to read this VERY IMPORTANT information. It does appear in all our documentation but we have found the necessity to highlight this information in a separate document. * A deposit is required in order to reserve the date for you, please contact us regarding the amount. * Final numbers must be confirmed 7 DAYS PRIOR to golf day. * We need your alphabetical guest list (to ensure easy access at security) TWO DAYS prior to your golf day. Please include the names of any people who will be assisting as well as attending the prize-giving on the day. * For security reasons we only have 30 caddies. If more caddies are required please pre book well in advance and all caddies ordered must be paid for. * NO 'TAKKIES' are permitted!! Please note that soft spikes are compulsory at Centurion Country Club. Please would you inform your guests / clients, in order to avoid any embarrassment on the day. No takkies allowed. Dress regulations in the clubhouse are smart casual. Please note that children are required to be neatly dressed and under control of an adult whilst in the clubhouse.